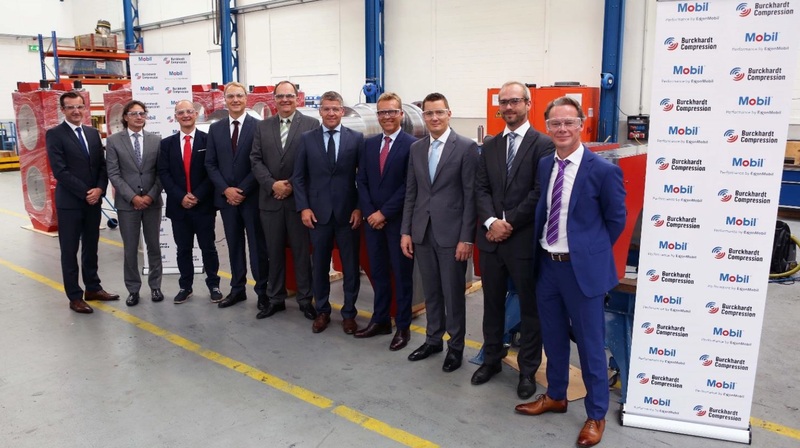 The team from ExxonMobil and Burckhardt Compression celebrate the signing of the global lubricants collaboration agreement at Burckhardt Compression’s facility in Winterthur, Switzerland. Burckhardt Compression and ExxonMobil have signed a global lubricants collaboration agreement. This collaboration supports new product technology, engineered specifically for the unique performance requirements of reciprocating compressor systems. The companies will provide a full range of equipment and technical lubrication services. These services, performed globally by Burckhardt Compression and ExxonMobil’s field engineering teams, include specialized training in products and lubrication best practices, lubricant analysis, equipment troubleshooting and maintenance support.